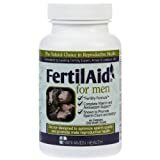 FertilAid for Men: Male Fertility Supplement | Medical Supplies and Equipment. FertilAid for Men is the nutritional supplement designed to improve sperm quality, sperm count, and sperm motility. It features a potent, proprietary blend of key antioxidants, vitamins, and minerals – as well as the amino-acid L-Carnitine. Formulated by fertility-specialist Amos Grunebaum, MD, these ingredients have been scientifically demonstrated to enhance male fertility and improve overall reproductive health.